The main image shows three curtains hung side by side. 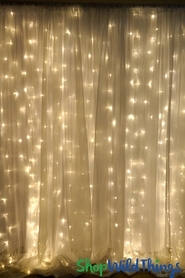 Memorable events start with unique lighting solutions and this incredible Organza LED Light Curtain will impress all your guests while creating a lustrous and radiant focal point! So popular with event planners and wedding coordinators, organza is a very sturdy fabric that's sheer, shiny, lightweight and downright gorgeous which makes it a popular choice for wedding and event decor. The curtain is 35" wide by 12' long. 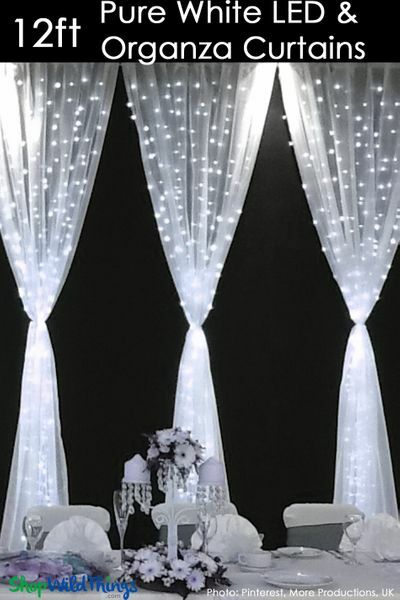 This panel has 288 powerful Pure White LED's that illuminate the romantic look of organza and since LED's don't get hot and last a very long time, this elegant curtain will outlast any event! There are vertical pockets across the width of the curtain and the light strand is inside these pockets. The span between the 2 outermost light strands is 30". The bottom of each pocket is sewn but the top is open so you can easily access the light if need be which means you can replace the white strand with a different colored light strand if you want and the fabric is washable! This is a tab-top top curtain which makes it a breeze to hang. Simply slide a standard curtain rod through the 4 tabs or use on a pipe and drape system. Each tab is 3" long so this can accommodate a large, thick rod as well. The 2 prong plug-in drape pulls 120V and comes with an AC adapter with an 18" long lead wire. This is for indoor use only. Use as a shimmering backdrop for a head table, as background decor during the "I Do's" or hang around a perimeter to create an indoor gazebo. 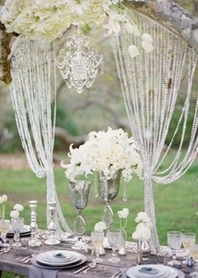 This curtain is perfect as a photo backdrop and the soft dreamy look is classy and attractive. it's also a great way to highlight a doorway or window and it's ideal to use with holiday decorations! Alternative looks: drape around a column, gently cinch the middle of the curtain to create an hourglass shape or fold in half or thirds to create a narrower panel with greater light intensity! You will get one curtain panel with your order that is 3 feet wide and 12 feet long.